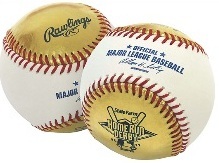 Rawlings, Gold Sport Collectibles and Major League Baseball have come together to release the official baseball for the 2011 State Farm Home Run Derby in Phoenix, Arizona. Using a unique combination of science and sport, the special ball has one leather panel that is literally infused with 24K gold. During the contest, any swing that doesn't result with a ball flying over the fence is considered an "out." Each player has ten outs per round. The gold ball will be thrown during the last out for each batter. For every gold ball that results in a home run, Major League Baseball and State Farm will combine to donate $18,000 to the Boys & Girls Clubs of America. Although a "gold ball" has been used during the tenth out of the contest since 2005, this will mark the first time that the Home Run Derby baseball will actually be infused with 24K gold. One might assume this would add significant weight to the ball, but this isn't the case. The process injects gold directly into the leather but the physical feel of the baseball does not change. The ball will still feel normal when hit, as well. The process for making the balls is considered 100 percent environmentally friendly. The newly debuted ball is available for sale on the MLB.com Shop, goldsportcollectibles.com and at the All-Star FanFest. The retail price is $149.99, which includes a display case and an official certificate of authenticity. Fans who manage to snag one of these baseballs during the home run derby will get a case to protect their collectible souvenir. The 2011 State Farm Home Run Derby takes place on Monday, July 11 at 8 PM EST on ESPN, the day before the All-Star Game. A new format is being used to pick participants this year. Prince Fielder and David Ortiz were appointed captains and picked the members of their squad for the National League versus American League contest. Keeping with tradition, an individual player will still be named the winner but the winning circuit gets some added pride.